When Maureen M. Goodenow joined the staff at UF 13 years ago, the College of Medicine had no ongoing HIV research  a condition that Goodenow soon remedied with her investigations into pediatric HIV and the molecular mechanisms that affect infection and treatment. Through her National Institutes of Health-funded research and collaborations, the College of Medicine has developed an interactive HIV program that combines both basic and clinical research. One of Goodenow’s earliest projects focused on pediatric HIV transmission, trying to puzzle out why only 30 percent of mother’s infected with HIV transfer the disease to their unborn children. 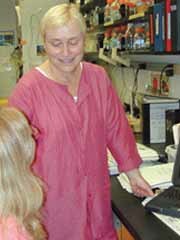 Goodenow and her team traced the difference to genetic variations in the virus and were able to describe why the anti-viral drug zidovudine reduces pediatric infection. Goodenow also looked at genetic variations in viruses to explain why some HIV strains are drug resistant. Physicians had thought that the hardiest viruses didn’t respond to drugs because they were reacting somehow to the medication itself. But Goodenow and her colleagues established that resistance was not simply a reaction to the medication and instead determined that some naturally occurring variations of HIV were inherently more resistant to the HIV drugs. Her work mapping the inherent genetic differences in HIV viruses also helped explain why protease inhibitors, medications which block HIV’s ability to replicate and multiply in the body, failed to work in some patients. Protease inhibitor failure had been blamed on patients failing to follow a treatment regime. Based on their studies, the research team developed a model that helps predict success or failure of drug therapies in new patients. Goodenow’s work suggests that it may be possible to develop drugs that precisely target certain genetic variants of HIV. Grants from National Institutes of Health provide Goodenow with more than $750,000 in funding annually.